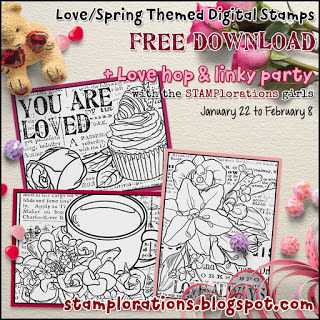 Stamplorations has these three beautiful spring/love themed digital stamps on their blog as a free download this month, and I couldn't wait to print one off and color it up. I love how one layer of UTEE gives it a wet, dewy look. A lovely floral creation Esther - thanks for joining us in our Fabulously Feminine Challenge at Stamping Sensations. A beautful burst of floral colour for our 'Fabulously Feminine' theme at Stamping Sensations challenge, many thanks for joining in. So beautifully colored, and I like that texture underneath! Thanks for joining in the fun with us at a2z this month. A lovely feminine creation! Great colouring! Thanks for joining us this month at Stamping Sensations and Good Luck! Lovely card with wonderful colors. So glad you joined us at A2Z Scrapbooking. This is such a beautiful card and I love the bright colours you used! Thanks for sharing your card at Love To Scrap! Challenge Blog! Hope to see you again soon!! HUGS! Esther, beautiful job coloring these flowers. Thanks for sharing with STAMPlorations love blog hop.